The range of motion and fluid, intuitive adjustments of the award-winning Flo are unsurpassed. Includes a Flo Top Mount Desk Clamp. The fluid, dynamic movement of Flo monitor arms lets you adjust the position of one or more screens with minimum effort and maximum precision. Keep the screen exactly where you need it without taking the time to tighten it. Patented technology gives you a large range of motion and quick, intuitive fingertip control, offering the perfect position to support everyone’s eyes, even people with progressive lenses. 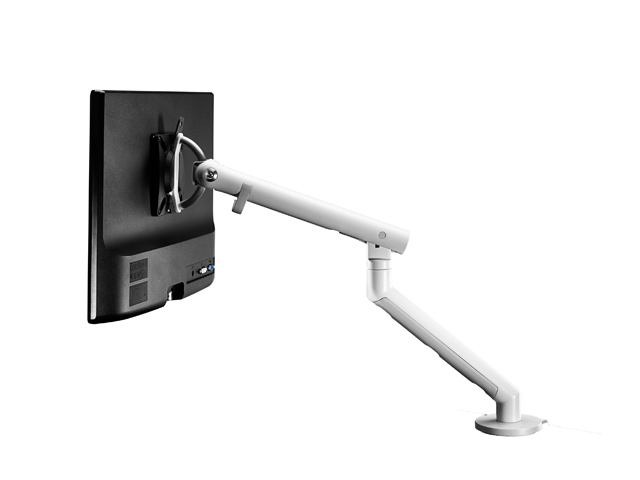 Designed by Colebrook Bosson Saunders, this dynamic monitor arm changed the game in ergonomic support. According to CBS, “As technology develops and allows us to interface with it in a more dynamic way, we need products that can do the same. Just as clever software requires no knowledge of the program to make it work, we wanted to create a solution that floats just where the user wants and adapts intuitively to be touched, shared and used dynamically. Good engineering, minimal parts and a responsible design using renewable materials create a product that people value and can use for a lifetime”. The Flo Top Mount Desk Clamp fits desk thickness from 12-25mm.